Everyone has the right to health. At Dignitas, we work to make this a reality for people who don’t have access to good health care. Dignitas International is a medical and research organization dedicated to improving health care for people facing a high burden of disease and unequal access to services. We are committed to working with patients, health workers, researchers and policymakers to tackle the barriers to health care. Dignitas was launched by Dr. James Orbinski and James Fraser as a humanitarian response to a global health catastrophe. In 2004, the AIDS epidemic was ravaging Malawi, a small country in sub-Saharan Africa, destroying its social and economic infrastructure and threatening its very survival as a nation. Without access to treatment and care, AIDS was a death sentence in Malawi. Hospitals were doubling as morgues as patients were literally dying in the corridors. The situation was an affront to human dignity. We began our commitment to addressing this crisis by setting up an HIV clinic in Zomba district the poorest corner of one of the poorest countries in the world. In our first month at the clinic, we started 33 patients on treatment. Today, this figure has climbed to over 301,652. In response to the AIDS epidemic, Dignitas International opens Tisungane Clinic in partnership with the Malawi Minstry of Health, dramatically increasing access to HIV-related treatment and care. 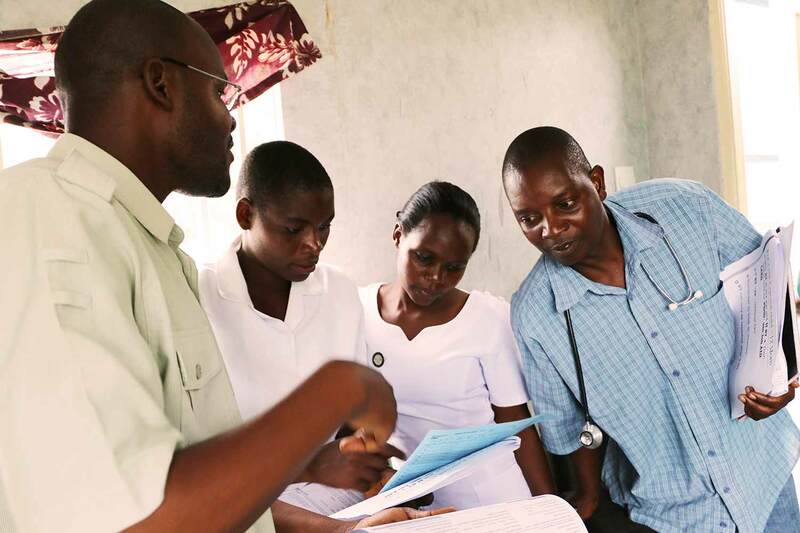 To improve patient care, Dignitas begins training and mentoring health care workers in the delivery of HIV-related services at Zomba Central Hospital. To address geographical barriers to treatment and care, Dignitas starts training health care workers at rural health centres to deliver HIV-related services across Zomba District. Dignitas establishes a Health Care Worker clinic, the first of its kind in Malawi. Its success prompts the opening of two more clinics in the country. Because Tisungane Clinic was the only health facility offering HIV-related services in the district at the time, many of the sick had to walk for hours and days from their villages to access treatment. Many more didn’t make it to our clinic simply because they couldn’t afford the cost of a bus ticket. Distance was a critical barrier to health care and was putting tens of thousands of lives at risk. In our view, the fastest and most effective way to reach the rural poor was to bring treatment and care to them. It was a crucial choice. Rather than engaging in direct service delivery, we worked to expand our model of care and trained health workers across the district to deliver HIV services. From the very beginning, we wanted to create ripple effects that would improve health care across Malawi. We also knew that if our efforts had a lasting positive impact on patients, we could leverage this knowledge to help others beyond Malawi’s borders. So we developed a robust research program to measure our successes and failures, and to publish findings that would be of use to health care providers facing similar challenges all over the world. We have supported up to 174 health centres in six districts, covering a population of more than 3.1 million people. From a standing start in 2004, we have helped more than 3.1 million people get tested for HIV and over 301,652 people start lifesaving treatment. This represents close to half of the total number of people on HIV treatment in the country. Dignitas establishes a co-located TB-HIV clinic enabling patients to receive simultaneous treatment with the goal of improving diagnosis and treatment adherence. Along with African and Canadian partners, Dignitas begins developing Streamlined Tools and Training (STAT), a practical training model to assist health care workers in remote areas to treat common conditions like HIV, TB and malaria. With funding from USAID, Dignitas expands its community-access model from one to six districts in Malawi’s southeast region, bringing HIV-related services to more than 3.1 million people. Malawi launches Option B+, a groundbreaking strategy to prevent mother-to-child HIV transmission. Dignitas supports the strategy by training health care workers on how to deliver the new treatment regimen. We are proud to have played our part in blunting the onslaught of AIDS in Malawi but our work is far from over. With HIV shifting to a manageable chronic condition, non-communicable diseases like diabetes, hypertension and cervical cancer are predicted to become the leading killer in Africa by the year 2030. These conditions are particularly prevalent for people living with HIV. It is clear that effective health care cannot be separated into disease-specific silos. We envision an integrated model so that patients can access a range of health services during a single visit at their local health centre. Going forward, we will continue to use our experience and expertise in HIV as an entry point to addressing broader health issues. For example, in 2014, we launched our Indigenous Health Partners Program (IHPP), where we are leveraging knowledge gained in Malawi to strengthen health care delivery in Northern Ontario, where health worker shortages and distance to health facilities remain key challenges. In partnership with the Ministry of Health, Dignitas launches Malawi’s first Knowledge Translation Platform (KTPMalawi), bridging the gap between health care providers, researchers and policymakers. A research study shows that HIV+ adolescents enrolled in Teen Club are three times more likely to stay on HIV treatment than those not in the program. Dignitas expands Teen Club across Malawi’s southeast region. Dignitas launches a partnership with Sioux Lookout First Nations Health Authority to address barriers to diabetes management and care faced by Aboriginal communities. With funding from Grand Challenges Canada, Dignitas kicks off training to help health workers provide integrated care for HIV and non-communicable diseases like hypertension, diabetes and cervical cancer. There is a pivotal opportunity before us. In the coming years, we will work to transform lives by developing and implementing models of care and sustainable solutions to global health challenges. We will dare to imagine a world where all people have access to quality health care. We invite you to join us in achieving this vision.